FIORENTE (IRE) (Brown 2008-Stud 2014). 6 wins from 1600m to 3200m, VRC Melbourne Cup, Gr.1. Out of a half-sister to SW Hyblon. 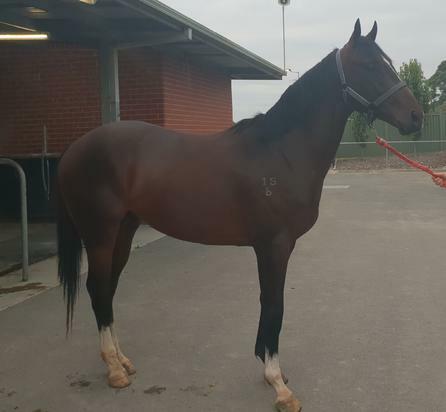 Sire of SW Stars of Carrum (Moonee Valley Vase, Gr.2) and of Mangione, Piemonte, Fariha, Hawkshot, Alessandro, Continuation, Lord Gladstone, Mannza, Moor Gait, Spensierato, Wham and of the placegetters Power Scheme, Busta Move, Gee Gee Fiorente, Georgina Gold, Irish Lilt, Mister Krumpets, Nero Veloce, Red Fiore, etc. His oldest progeny are 3YOs. LONHRUGE, by Lonhro. 4 wins from 1400m to 1800m, A$112,685, MRC Springers H., Hyland Race Colours H., There's No Better Bet Than a Sportingbet H., Mitavite H., 2d MRC Le Pine Funerals P. This is her first foal. Lonhruge. 4 wins. See above. Perfectly Safe. 2 wins-1 at 2-at 1200m, 1300m, A$91,125, MRC Grand Hotel Frankston 2YO H., 2d MRC Cove Hotel H., 3d MRC Wedrive.com.au H., MVRC Strathmore Community Bank H.
Hot Dubai. 3 wins at 1500m, 2000m, 3d BRC Best Security H.
Declasse. 3 wins from 1400m to 2600m in Aust. Not Usual Current. Winner at 1000m in 2018-19 in NZ. The Lad's My Dad. 3 wins at 2, A$105,000, Rockhampton JC Yearling Sales 2YO Classic. TEA GARDEN (Barathea). 6 wins from 1400m to 1600m, €179,096, Rome Premio Nearco, L, Milan Premio Monforte, 2d Rome Premio Allez France, Premio Siberian Express, Premio Morston, Premio Levmoss, Premio Beverly, 3d Rome Premio Daumier, L, 4th Milan Premio Gardone, L.
A SOLDIER'S LIFE (Authorized). 2 wins at 2000m, 2500m, Deauville Prix Vulcain, L, Saint-Cloud Prix de Frauenfeld, 2d Saint-Cloud Prix Tourbillon, 4th Longchamp Prix Noailles, Gr.3. Alamanni (Elusive Quality). Joint Champion Older Female in Italy in 2008 (Intermediate). 2 wins at 1200m, 1600m, €78,088, Milan Premio Melegnano, Premio Morimondo, 2d Milan Premio Chiusura, Gr.3, Premio del Piazzale, L, 3d Rome Premio Tadolina Memorial Galli Patrizio, L, Milan Premio Motta, 4th Rome Premio Lydia Tesio, Gr.1. Producer. PENGLAI PAVILION (Monsun). 8 wins-1 at 2-from 1600m to 4250m, £60,818, €258,080, A$20,000, Saint-Cloud Prix Turenne, L, Newmarket Cesarewitch Trial S., Deauville Prix de Pont Audemer, Saint-Cloud Prix Prince Bio, 2d Grand Prix de Deauville, Gr.2, Longchamp Prix Blangy, 3d Cheltenham Hyde Novice Hurdle. CREATIVE THINKING (Creative Cause). 3 wins at 1m, 1½m to 2018, Churchill Downs Keertana S., L, Keeneland Allowance, 3d Woodbine Flaming Page S., L.